Mint in the original box. It has never been removed except to inspect the item. It comes with a certificate of Authenticity. 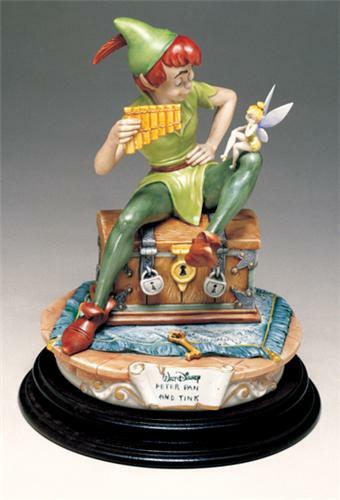 Exuding the essence of all that is Peter and Tinkerbelle, you'll find our sculpture precious in every detail. This exquisite porcelain Capodimonte sculpture is from the Disney Laurenz Classic Collection. limited edition of: 417 pieces total made world wide. This is the Rolls Royce of Porcelains. This was created by Enzo Arzenton. He is an Italian sculptor who suddenly took ill and closed his shop in Italy. He did all the molds, fired all the pieces, and hand painted all the pieces to his perfection. This is truly a work of art.